The IICRC is a nonprofit certification and Standards Developing Organization (SDO) for the inspection, cleaning and restoration industries. In partnership with regional and international trade associations, the IICRC represents the entire industry. The IICRC is recognized internationally as a knowledgeable industry voice and resource. Professional restoration technicians understand the need for quick response. Immediate remediation is key to controlling any escalating costs. The longer the remediation is delayed, the higher the cost of restoration. Certified restorers have the knowledge to test materials and apply the restoration techniques required to return the items to their preloss condition. SERVPRO of Carbondale/Clarks Summit/Old Forge is an IICRC certified firm. Our membership number is 203810. We follow all IICRC standards in our water, fire and smoke cleanup and restoration as well as our mold mitigation work. SERVPRO of Carbondale/Clarks Summit/Old Forge is in the midst of addressing the prevalence of burst pipes throughout Northeastern Pa. Unfortunately this extreme weather pattern will continue for the next few days exasperating the problem. When this extreme weather pattern changes early next week, we will see a increase in the number of burst pipes. It’s not the freeze but the thaw that causes the disaster. We are available 24/7 to respond to any water disaster resulting from this storm. We have the experienced water restoration technicians and specialized equipment to help make it "Like it never even happened”. We are proud to serve our local Scranton/Lackawanna County community. A night by the fireplace will keep your heating bill lower and keep you nice and toasty. But wood burning appliances have become the largest source of heating-related fires in U.S. homes, so it’s important to understand how to safely maintain your chimney and fireplace. Take the time to learn just what kind of chimney and fireplace you have. If you have a freestanding wood burner with a factory-built metal chimney, make sure to have a professional install it or follow the manufacturer’s specific guidelines, as those have been created using the appropriate national standards. Also, be aware of the proper placement of a fireplace in a room. Always have a floor protector below it, and have it extend at least 18 inches on all sides. You don’t want a loose piece of wood to pop out of the fire and end up on the nearby carpet or wall. With a masonry chimney, always close the screen once the fire is lit. Be especially cautious with your young children, and don’t let them within three feet of any kind of fireplace. Stoke your fire with the poker and andirons, not other pieces of wood. And keep the chimney flue open to ensure that the fire is properly ventilation. The most significant thing to consider in regards to chimney safety is creosote. This is a black tar-like residue that collects in the chimney flue from past fires. Creosote is highly combustible, and over time can accumulate thickly enough to start a chimney fire. For this reason, you’ll want to call a chimney sweep at least once a year before the heating season for a professional cleaning. The sweep should fix any cracks, blockages, or leaks in the masonry or lining of your chimney that could present a future hazard. Inspect your chimney often; a good rule of thumb is to have the chimney cleaned if there is 1/8 inch to 1/4 inch of creosote on the walls or lining. In the meantime you can take precautions to avoid further creosote buildup. Only burn seasoned wood. Not all firewood is created equal. You’ll want wood that was cut the previous year and has been stored away since that time. This wood is dark or gray compared to freshly cut, unseasoned “green wood.” It is brittle, has cracks running through each piece, and is quite dry. It will produce the most heat and least amount of creosote. Avoid slow, smoldering fires. Having more smoke than flame in your fireplace is never good. Reduce the smokiness by not burning newspapers or cardboard for kindling. Cut wood into thin sticks to get the fire going. Also, don’t use lighter fluid because it burns up quickly, leading to more smoke. Burn everything up. Use a highly efficient fireplace that fully burns all the combustibles and turns everything to dust. SERVPRO of Carbondale/Clarks Summit/Old Forge, Northeastern Pennsylvania premier specialty cleaning company is proud of our relationship with State Farm insurance and is pleased to provide these safety tips. SERVPRO of Carbondale/Clarks Summit/Old Forge proudly serves all of Scranton and Lackawanna County communities. Ice dams lead to water seeping into the ceiling of this home in Scranton. Ice dams are problematic and cause some serious damage. The weekend forecast calls for exceptionally cold weather. This is problematic on several fronts for homeowners and businesses, but with the recent snow on the roofs, ice damming is a main concern. Ice dams are a pervasive and damaging winter roofing problem caused by poor roof ventilation and a warm attic space. Left untreated, ice dams can cause serious damage to your roof, gutters, paint, insulation, drywall, structure and even contribute to mold. Ice dams form when melting snow on a roof runs off and refreezes at the edge of a roof. This condition occurs when the snow is melted by a warm roof, creating water running between the snow and the warm roof surface, then freezing and turning to ice when it gets past the exterior wall and hits a cold unheated roof edge or gutter. The water backs up and eventually seeps into the inside of the home or business. SERVPRO of Carbondale/Clarks Summit/Old Forge responds to many water emergencies which are the result of ice damming. Water is an amazing phenomenon and without professional drying can lead to both structural and health concerns over the long run. Be proactive and prevent your home or business from experiencing an ice damming situation and a costly repair. However, if it does occur call a professional restoration company to ensure you and your family's health and safety. SERVPRO of Carbondale/Clarks Summit/Old Forge is the Scranton/Wilkes-Barre area leader in smoke, fire and water cleanup. We are an IICRC certified firm and follow all the recommended guidelines in drying any water disaster. An emergency services company we are available 24/7/365. 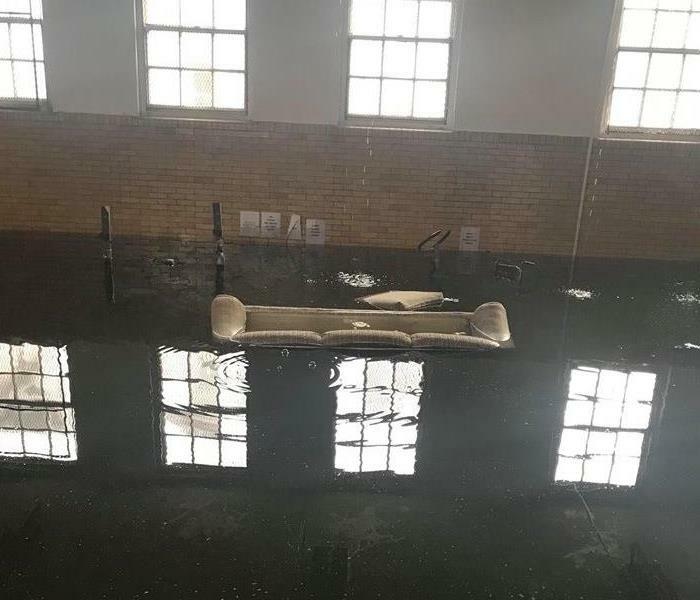 Several pipe breaks in this idle Scranton building lead to this entire basement being flooded with several feet of water. his extreme cold weather pattern continues to wreak havoc upon northeastern Pa. Picture above is a commercial property whose sprinkler system froze and burst causing a tremendous amount of damage. The property owner failed to maintain heat in the building which resulted in several pipe breaks. Since the building was idol the water continues to flow for hours before it began to inundate the structure. The entire building experienced water damage and the basement filled with approximately 5 ft of water. The damage is extensive and since the property was not properly maintained, insurance will not cover it. SERVPRO of Carbondale/Clarks Summit/Old Forge was called by the city to address the property. Large scale water disasters are SERVPRO of Carbondale/Clarks Summit/Old Forges specialty. We have the trained employees and specialized equipment to handle the job. We are able to utilize other SERVPRO franchisees or our corporate disaster response team. No job is too big. The force of this burst pipe caused this ceiling damage to this building in Scranton. This void in the ceiling was created by a pipe that burst. The pipe split down the seam in the middle of the night of this skilled living facility in Scranton. The force of the water caused the ceiling to collapse as well as flood the interior of the facility. Water is an amazing phenomenon with its force and power. As the old adage states, it finds its lowest level and travels along the path of least resistance. Until it is stopped and/or impeded it will continue to flow and without proper extraction and dehumidification will cause extensive damage. 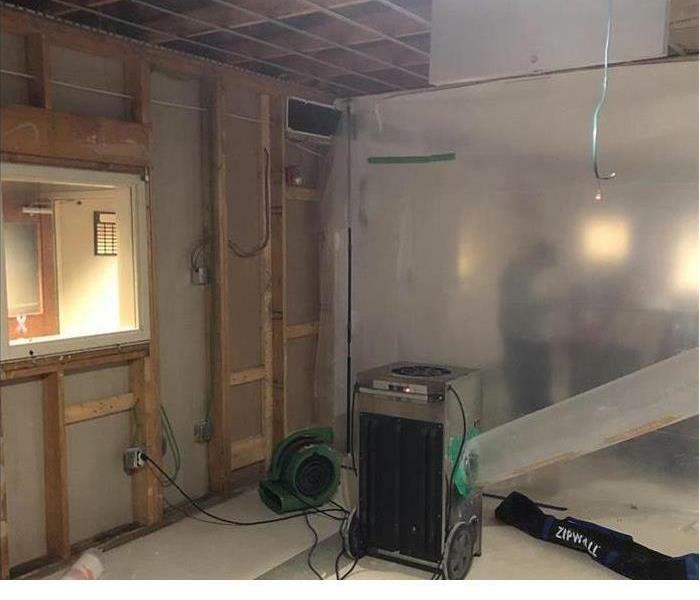 Restoration companies like SERVPRO of Carbondale/Clarks Summit/Old Forge are utilized by commercial facilities and insurance companies to properly dry and reduce secondary damage. The goal is always to return the facility back to a healthy working and living environment. In this incidence, SERVPRO of Carbondale/Clarks Summit/Old Forge was on site within two hours of the break and worked throughout the night to ensure the safety of the occupants as well as to reduce the business interruption. We were able help keep them open. Toilet Supply Lines-What to do When They Fail. 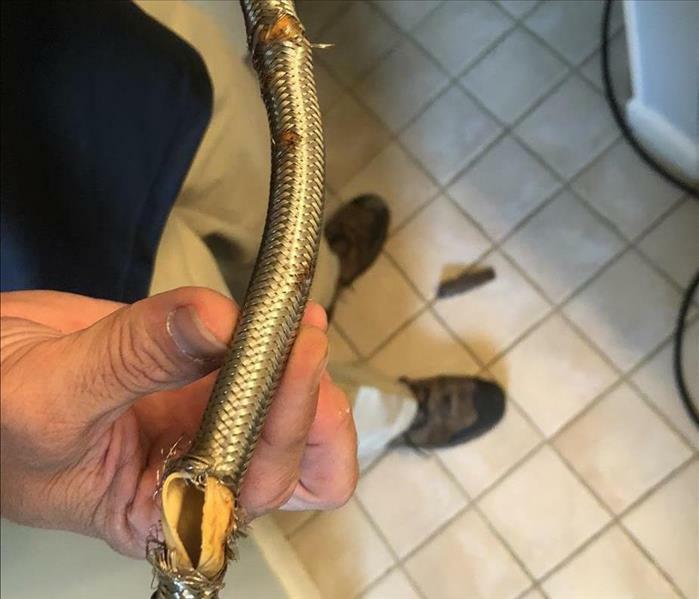 A toilet supply line is a common cause of all residential water damage. Understandably bathroom water leaks cause significant damage to a home. This is especially true if the bathroom is located upstairs. The main culprit is usually a supply line issue. Older homes are likely to develop a slow leak, whereas newer homes are more likely to experience a sudden and more significant toilet failure (often due a faulty supply line or fill valve) and water damage. Toilets can also create a water loss if they become clogged after use or if something accidentally falls in the toilet and goes undetected prior to being used. If a clog occurs, promptly turn off the water supply valve. Also, remove the top of the tank and close the flapper or lift the float to stop water. While accidents occur, it is always recommended to use a higher quality supply line and if you a notice a leak, change it promptly. preventive maintenance is always the key in preventing disasters. Luckily, More times than not, a faulty supply line will be a covered loss by your insurance company. 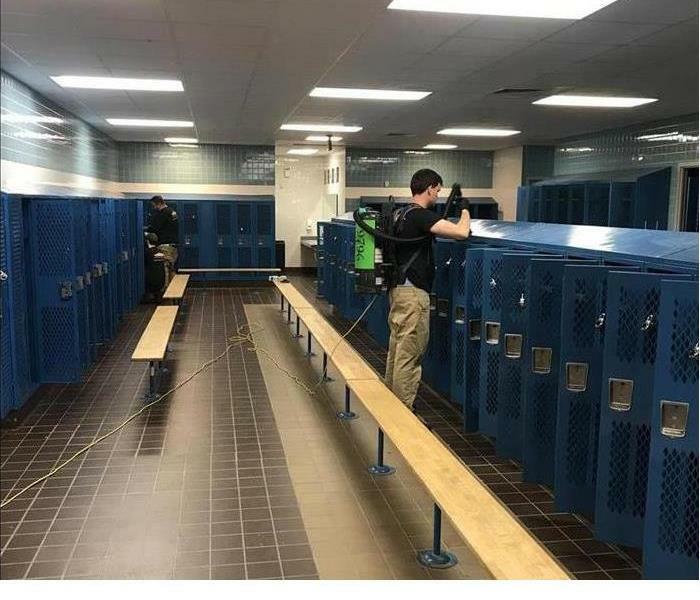 The SERVPRO of Carbondale/Clarks Summit/Old Forge certified technicians are employing the use of a hepa-vacuum and anti-bacterial cleaning agents in the locker room of this local school district. This pro-active district tasked us with this project as a precaution following a busy summer and fall sports season. As the old adage states "An ounce of prevention is worth a pound of cure." This project will address any bacterial viruses by cleaning and disinfecting the interior surfaces. These can often be spread through contact so the district thought it wise to preempt any such occurrences. Since SERVPRO of Carbondale/Clarks Summit/Old Forge used a green product the district was assured of the safety of the students and staff. As a specialty cleaning company, SERVPRO of Carbondale/Clarks Summit/Old Forge has the trained personnel, proper equipment and the unique knowledge to help school district keep their students and teachers in a safe learning and working environment. As a company, SERVPRO of Carbondale/Clarks Summit/Old Forge thrives on being able to help our local Lackawanna County communities. Our restoration technicians built this drying chamber to help facilitate the drying of the room. Creative solutions separate us from the rest. The below picture is the inside of a drying chamber we created at this skilled nursing facility in Scranton. They experienced a pipe break in the ceiling which caused extensive water damage throughout the building. SERVPRO of Carbondale/Clarks Summit/Old Forge was dispatched to mitigate the damage. Since the break occurred in the ceiling and sent water upwards, the attic and under roof needed to be dried to avoid potential mold issues. The ceiling void was large so this chamber helps isolate and direct specific areas to be concentrated on and dried. As you can see once the chamber is created, we employ the use of a dehumidifier to remove the excessive moisture, thus raising the temperature to help facilitate the drying process. By isolating the wet spots we can dry it quicker thus saving time and money. Specialty drying is just one reason, SERVPRO of Carbondale/Clarks Summit/Old Forge is the Lackawanna County's leader in smoke, fire and water damage cleanup and restoration. 1/16/2019 - Toilet Supply Lines-What to do When They Fail.